This is one of the largest amounts to have been awarded to a single project in the European Union’s Horizon 2020 research programme, and will help boost Norwegian production of zero-emission vessels. 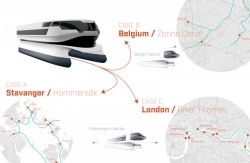 The project, which will commence in the spring and last for four years once the contract with the EC has been signed, will also conduct two studies for the same type of vessel in London and the inland waterways of Belgium. The initiator of the project is industry cluster NCE Maritime CleanTech, which encompasses 75 Norwegian companies from the entire maritime value chain and focuses on developing energy-efficient and environmentally friendly solutions for the maritime industries. Rogaland County Municipality is a partner in the cluster and will, as owner of the vessel connection and a purchaser of transport services, be the project coordinator. Other members of the project include Leirvik, Fjellstrand, Servogear, Wärtsilä, Validé, Kolumbus and Hydro Extrusions Norway. The project is also supported by the Research Council of Norway and Innovation Norway. Rogaland County Municipality will contribute US$640,000 (€520,0000) to a demonstration vessel, and has committed to putting it into service between Stavanger and Hommersåk. The vessel, which will be built by Norwegian shipyard Fjellstrand, will be operated by Kolumbus and will accommodate 150 passengers and 20 bicycles. It will operate at a speed of 23kts.